The house for Karl and Martha Lemke is an illustration of Ludwig Mies van der Rohe's sentence "architecture begins if two bricks are carefully assembled“ – both literally and in terms of its volumetric composition. It is a small, simple brickwork structure finished in 1933 and situated on a double piece of land on the lake Obersee in Berlin–Hohenschönhausen with the landscape designed by the office of Karl Foerster and executed by Herta Hammerbach and Hermann Mattern. The L-shaped configuration opens toward the garden and the lake; the facades correspond to this with great openings to the terrace and smaller windows to the street. Nevertheless the entrance door is completely glazed and adds to the relative transparency of the solid building. After entering, there is another glass door to the left leading to the study and the bedroom, whereas a wooden door takes the view from the living room with adjacent kitchen and service area. 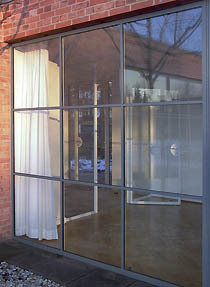 The main effect is experienced while being in the studio or living room; the outside is in between, and one looks out and in again: a reflexivity of the view is obtained that is increased by the mirrored exterior. Mies van der Rohe, then director of the Bauhaus, dealt with the idea of the courtyard house and developed it in different projects and with his students. Landhaus Lemke is the only realised example of this typology. 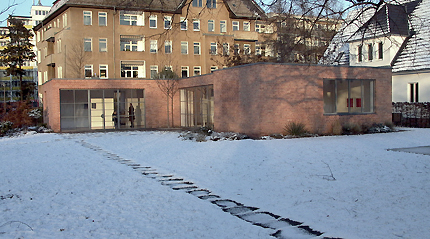 This building is the last one Mies van der Rohe built in Germany before going to exile in 1938. In 1945 the Soviet Army forced the Lemkes to leave the house. It was taken over by the Staatssicherheitsdienst of the GDR and converted to a laundry and a garage. 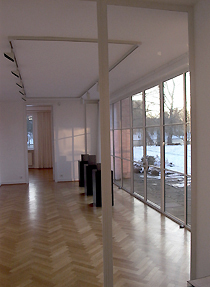 In 1990 the building was inherited by the city of Berlin from Mrs. Lemke, who also gave the custom-made furniture by Mies van der Rohe and Lily Reich to the Kunstgewerbemuseum of Berlin. Take the tram M5 from Alexanderplatz, stop Oberseestrasse. Walk back a few meters, follow the Oberseestrasse and the building is on the left towards the lake. As it is a gallery today it is open on a regular basis. For more information please call +49 30 9700 0618 or visit www.miesvanderrohehaus.de (web site in German only).